So, it's a well-known fact that there are a number of nameless manufacturers over in China that make complete copies of well-known smartphones. Not your average “borrowing of ideas”, but an actual clone, usually with a weak hardware and super-cheap price to draw as much attention as it can. 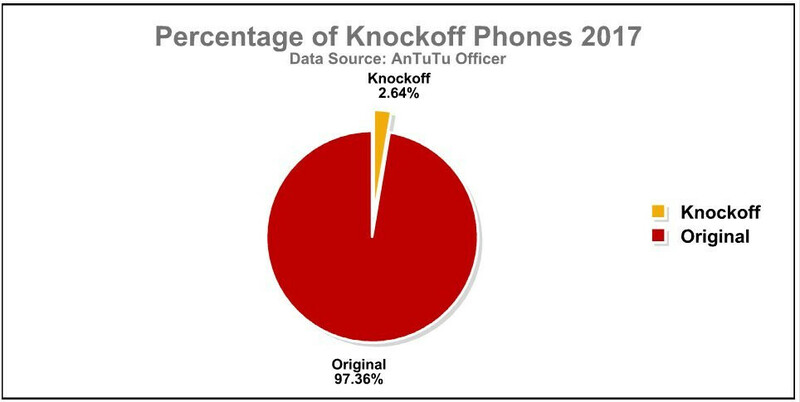 Popular benchmark company AnTuTu has released an interesting statistic for 2017. 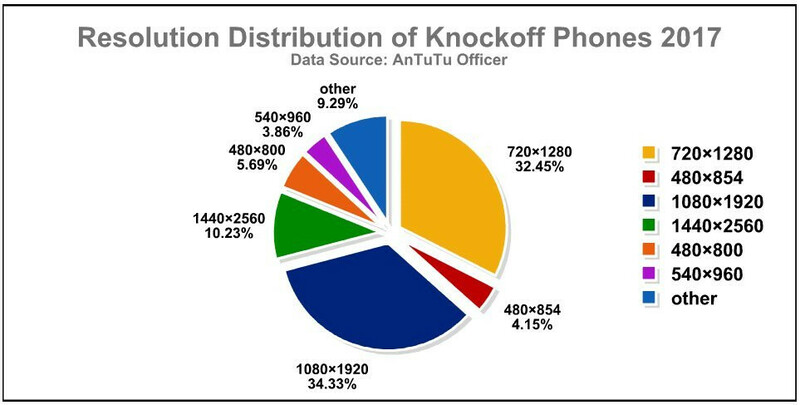 It combed through all devices that held the AnTuTu tests from January through to December and concluded that 2.64% of all phones tested were clones or counterfeits. Of these, the Galaxy S7 edge was easily the most copied device. 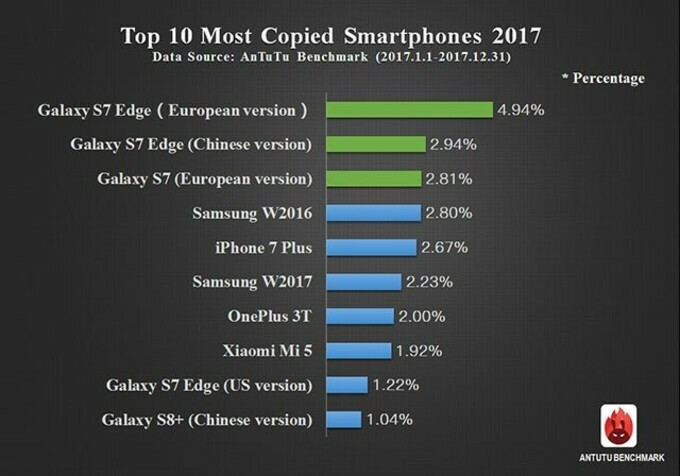 In fact, the number 1 most copied is the EU version of the S7 edge, while the 2nd most copied is the Chinese version of the S7 edge. Then, we have the regular S7 (EU version) on the 3rd spot and the clamshell Samsung W2016 placed 4th. The first and only iPhone we see on the top 10 list is the iPhone 7 Plus, placed in 5th place. So, according to AnTuTu's stats, Samsung-branded phones are the most-often cloned devices. We can see a few reasons for this — for one, it's much easier to make a clone with Android to operate like another phone that's a famous Android flagship. Coding an iOS-like UI on top of Android is possible, we've seen impressive ones in the past, but it doesn't hold up — as soon as the user opens the “App Store”, or takes a dive in the phone's Settings, they can see the telltale signs of Android. So, if you want to trick more people — just stick to the phone with the operating system you can best imitate. Also, it's worth noting that a lot of people that buy these phones will not install and run AnTuTu benchmarks on them, while others will get their hands on a specific clone and run a ton of benchmarks on it just to see what kind of results they get. So, while these stats can give us a bit of an insight of which phones were among the most interesting for bargain-hunters in 2017, they definitely don't tell the whole story. What about phones that copied Sharp Aquos Crystal? Agree. And this is BS: 'for one, it's much easier to make a clone with Android to operate like another phone that's a famous Android flagship.' How hard is to ''copy'' App-drawer skin and go to Google Play for apps? And operate even better than iPhone. LOL iExcuses only. The Chinese copying the biggest copycat. Can't get any worse than this. They do but its easier to spot when it only can run Android instead of IOS. Chinese phones are junk. I wouldn't buy their phone. Nah, Apple copies as well. And removes important features, something that Samsung doesn't. Almost all 18:9 phones look alike ( except Mate 10 combo) , so we have to count as copy. Now how about a graph showing which country these copycats are from. Well duhhh...even Apple copies Samsung. Would you rather copy a company that gets design awards or one that covers your screen with a unibrow? The only reason S7 get 1st place is because it's hard to copy S8 screen with it's slim bezels and curved screen.. All S8 clones is using thick black border on top, bottom, and curved side, it's looks hideous, lol..